Is anyone else STILL in a post-Thanksgiving turkey coma? I hosted this year, as I have for the past several years, and boy, does it take it out of me! Don’t get me wrong, I love every second of it, but it is exhausting. I cooked for the first time last night since Thursday. That’s how tired I’ve been! It takes me a few days to recover. Given that I am almost six months pregnant, I think I can give myself a pass. If you’re like me and want ANYTHING but turkey and you’re looking for a fun, festive pick me up to get you into the next wave of holiday spirit, I have you covered. 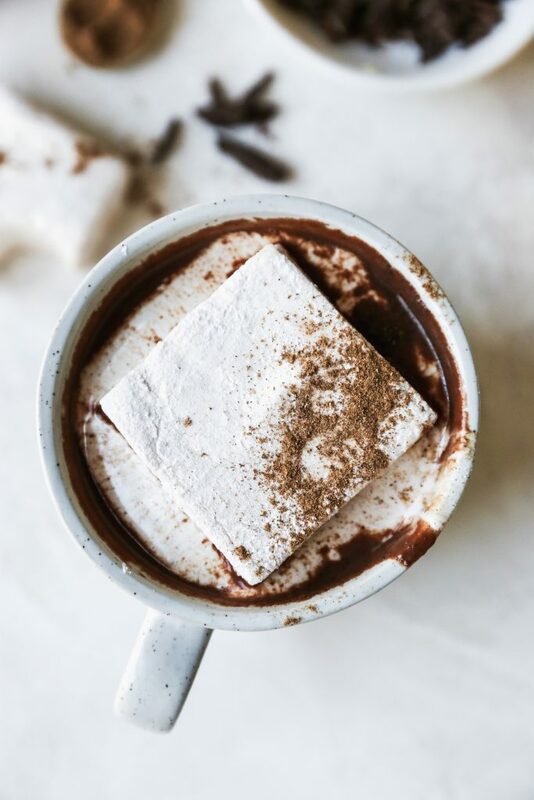 Enter hot chocolate with homemade chai-spiced marshmallows! 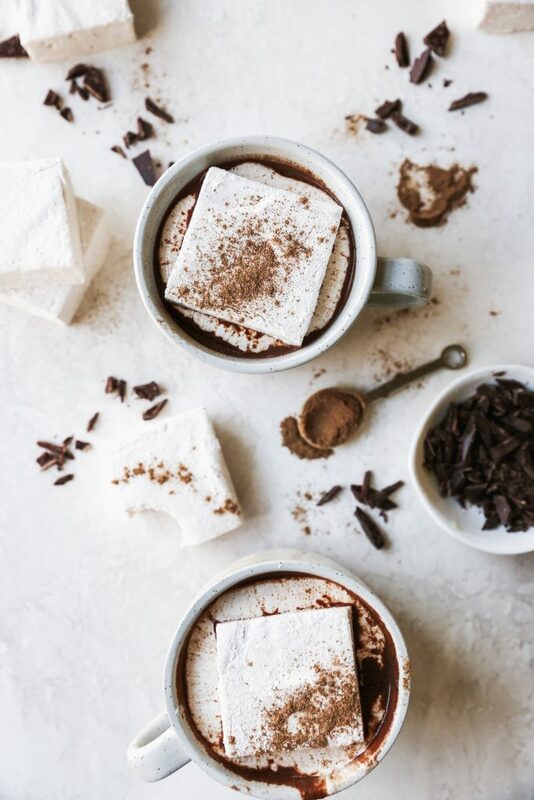 And we’re not talking just any old hot chocolate. One of my biggest pet peeves, in fact, is BAD hot chocolate. I looooathe when it’s watery and not creamy, lightly chocolatey instead of deeply rich, and BORING. Ugh. And don’t even get me started on the hard little rocks people like to pass off as marshmallows. THIS hot chocolate is everything I love about hot chocolate. It’s rich, creamy, DEEPLY dark chocolate, and has a ton of flavor all on it’s own. 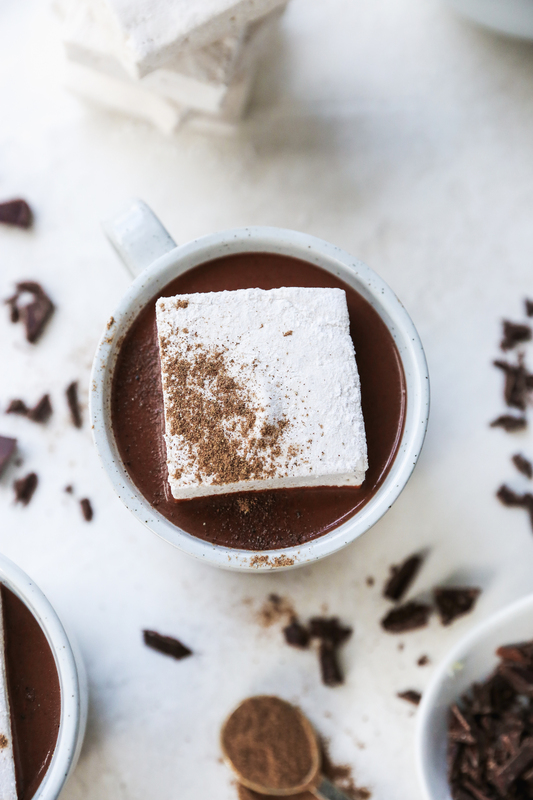 I want my hot chocolate to be so decadent that it coats every nook and cranny of your mouth. I want it to be deeply, darkly chocolate…because this is the way I like almost all my chocolate things. The marshmallows are just an added bonus, and THAT is how hot chocolate should be! Not to sound like a total elitist or anything, but homemade marshmallows are SO MUCH BETTER than storebought. 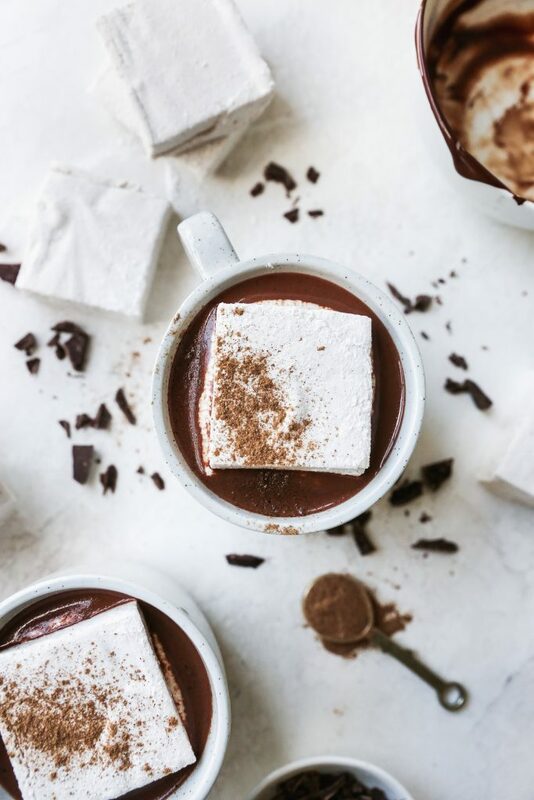 And when I am going to take the time to indulge in a cup of rich hot chocolate, you better bet that the marshmallows needs to live up to my perhaps too high standards. 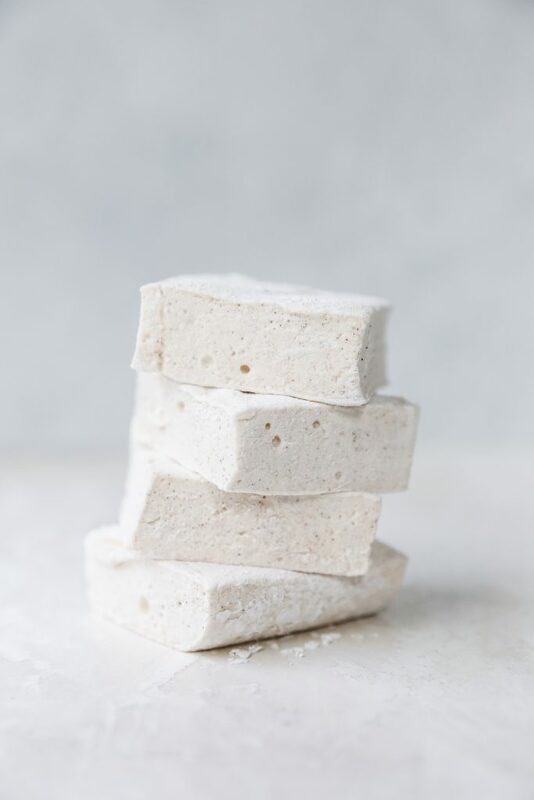 Making homemade marshmallows has been life changing. It’s just crazy to me how much better they taste, and texturally, they’re a dream. I am not a HUGE marshmallow fan in general. I mean, I like them, but they aren’t something I go nuts over. UNLESS they’re homemade! 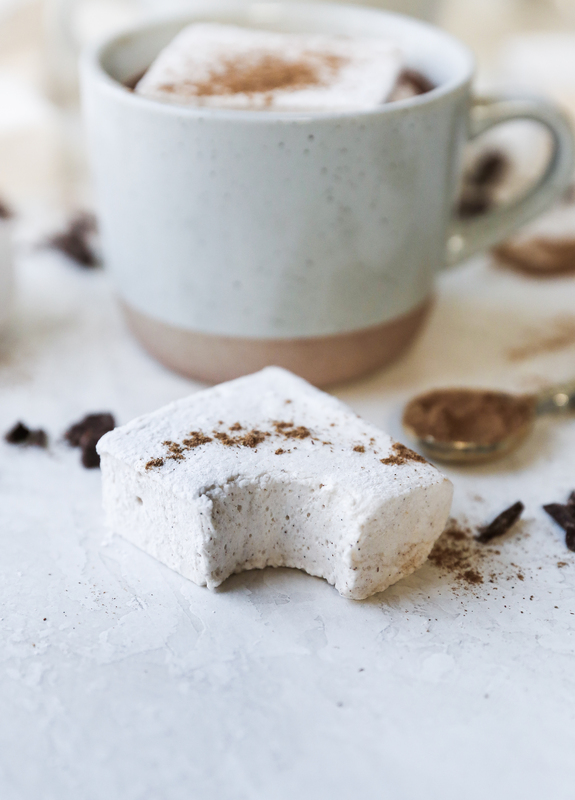 Homemade marshmallows give me life! I lose my mind over them. They are so freaking fluffy. So! 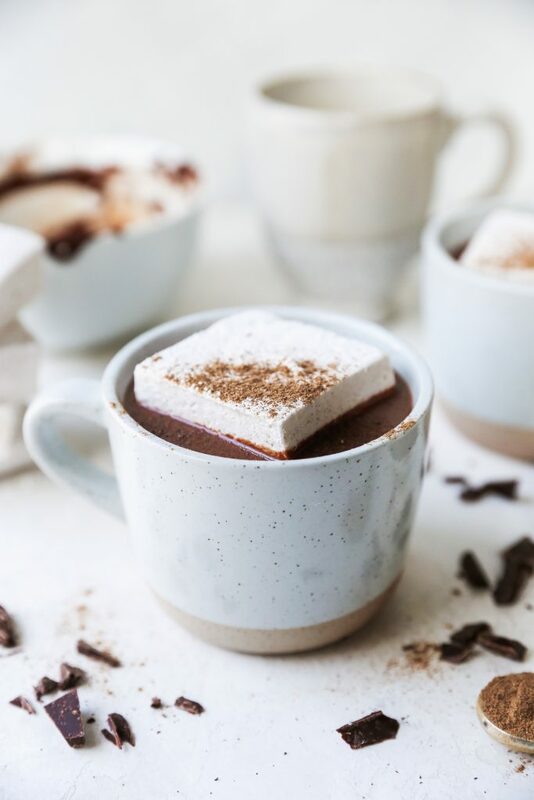 When I was coming up with this recipe, I knew I wanted the hot chocolate to be the stuff of dreams (or at least the stuff of MY dreams, haha), and I knew I wanted the marshmallows to not only be homemade but to be flavored in some fun, cozy way as well. I went with chai-spiced marshmallows and I have absolutely zero regrets. You guys, I think chai spices and chocolate are destined to be together. The magic they create is, well, MAGIC. So yummy! 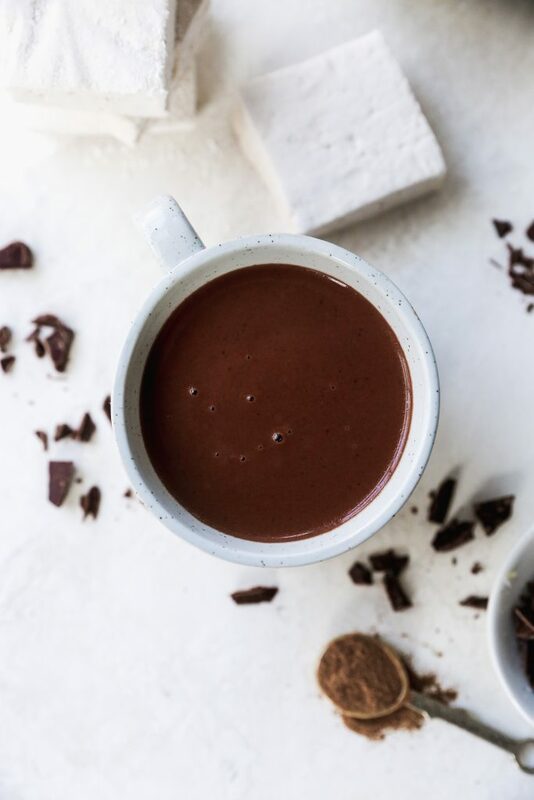 I used a dark, bittersweet chocolate (60-70% is ideal), and this paired with the sweetness of the marshmallows and spices is a dream come true. I could not stop drinking this. In fact, as soon as I finished taking these beauty shots, I downed an entire cup of the stuff along with a marshmallow or three (Seriously! They are so good!). And then I promptly took a nap. Just kidding about the nap part, but that’s exactly what this type of drink makes me want to do. Curl up under a cozy blanket with a puppy or two on my lap and drift off to dreamland. 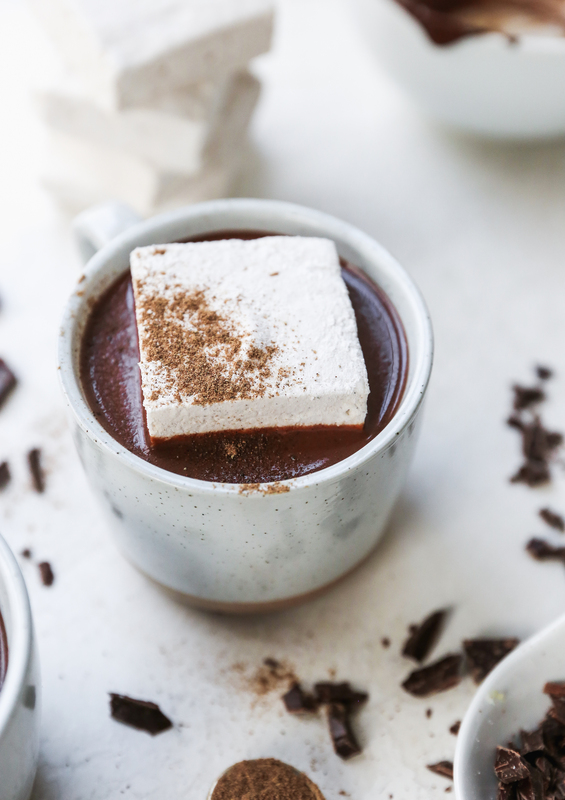 Like I said, this version of hot chocolate and marshmallows is the stuff of dreams. Liberally grease a 9 x 13-inch baking dish. 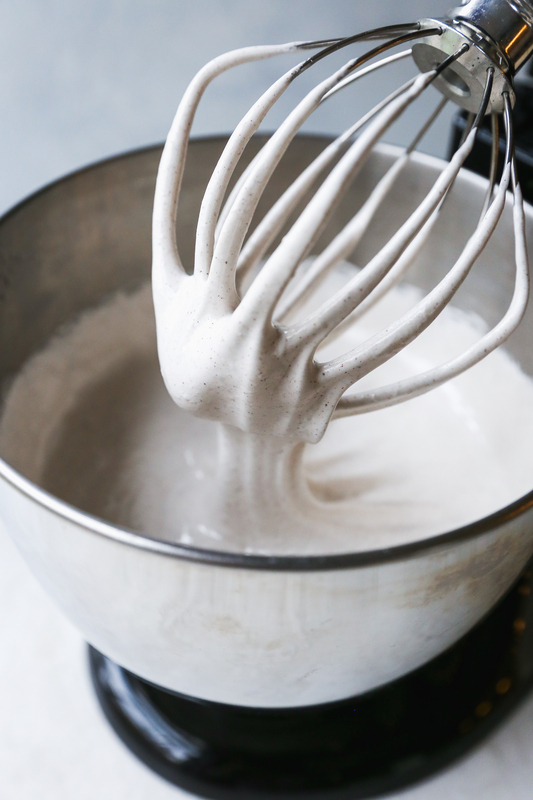 Whisk together the powdered sugar and cornstarch in a small bowl and then dust the greased dish all over with the mixture. You want the bottom and all sides of the dish well and evenly coated. Meanwhile, in a large saucepan fitted with a candy thermometer, combine the granulated sugar, corn syrup, salt, and remaining ¼ cup cold water. Heat the mixture over medium-high heat, stirring to help the sugar dissolve. Bring the mixture to a boil and cook until the thermometer reads 240°F, about 1-2 minutes. Turn the stand mixer on the lowest speed and VERY CAREFULLY and slowly stream in the hot sugar mixture to the gelatin mixture in the bowl. Once all of the hot sugar mixture has been added and somewhat incorporated, gradually increase the speed of your mixer to high. Beat on high for 5 minutes, or until the mixture has started to grow in volume. Stop the mixer and add in the chai spice and vanilla bean paste/extract. Continue beating the mixture on high for another 5-7 minutes or until it has doubled in volume, is glossy and white, and can hold stiff peaks. Grease a spatula and use it to help pour the mixture from the bowl into the prepared baking dish. Smooth out the top as much as possible with the greased spatula. Dust the top of the marshmallow mixture with a tiny bit of powdered sugar and then lightly cover the dish with plastic wrap. Allow the marshmallows to sit at room temperature for 3-4 hours, or until they are set and firm (a little jiggle is good!). Dip a sharp knife in powdered sugar and run it around the edges of the pan. 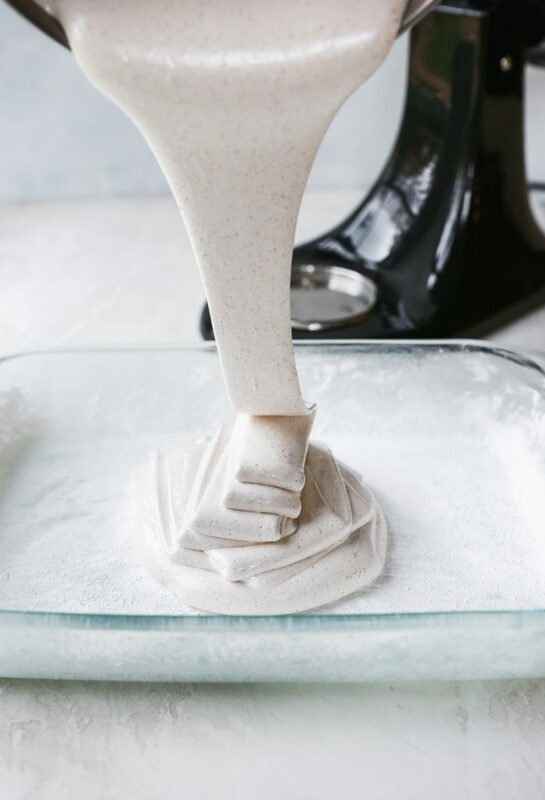 Carefully invert the marshmallows onto a surface dusted with powdered sugar. Use the knife to slice the marshmallow into squares. If your marshmallows are excessively sticky, dust them lightly with powdered sugar. Leftover marshmallows can sit at room temperature, well wrapped, for up to a week. Once your marshmallows are ready and cut, start making your hot chocolate by combining the milk and sugar in a medium saucepan. Place the pot over medium heat and whisk until the sugar dissolves. 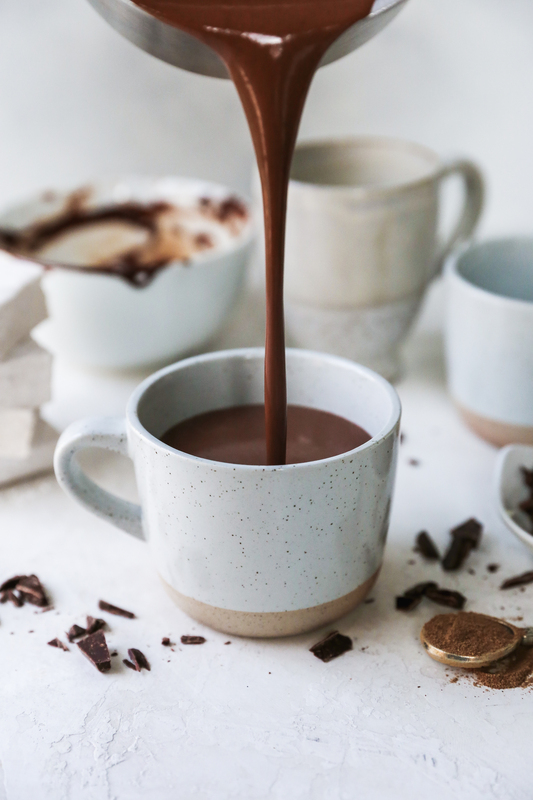 Meanwhile, place the chopped chocolate in a heat-safe bowl and microwave on LOW in 20-second increments, stirring after each session, until it is melted and smooth. Once the milk is hot but not boiling, whisk the melted chocolate into the pot. Keep stirring until everything is smooth and creamy and well mixed. Add the salt and vanilla and whisk to combine. 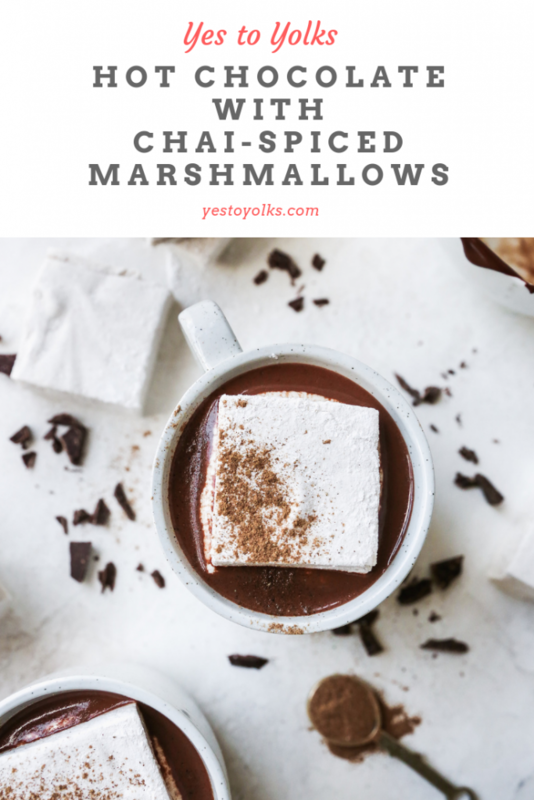 Pour into mugs and garnish with the chai marshmallows and a dusting of chai spice. Marshmallow base adpated from here.